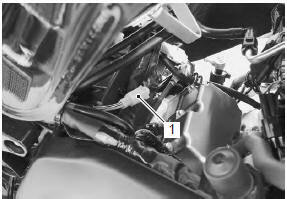 Disconnect the rear brake light switch lead wire coupler (1). Inspect the rear brake light switch for continuity with the tester. If any abnormality is found, replace the rear brake light switch with a new one. Connect the rear brake light switch lead wire coupler. Reinstall the fuel tank. Refer to “fuel tank removal and installation” in section 1g .